I found this wonderful image on Pinterest of a vintage makeup kit from the 1930s by Max Factor. This was used by makeup students for film and theater. Isn´t it adorable? I thought I am gonna revamp this kit with items that are available today! 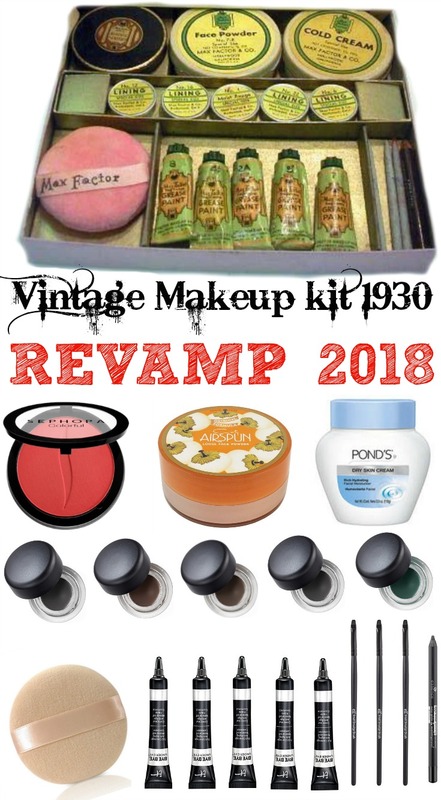 Though our Makeup artists today probably have to carry multiple suitcases to get our celebrities makeup ready- this case was all that Max Factor needed to get Joan Crawford, Bette Davis or Jean Harlow movie-ready! So, what´s inside the Max Factor Makeup kit? In the 1930s blushes were red! Fun fact: In Germany we still use the term "rouge". Besame Cosmetics specializes in creating fabulous retro-inspired makeup (1938 Crimson is a great dupe/$18), (oh check out also my lipstick swatches of exact replicas) but they are often limited edition and sold out- therefore I found a similar blush by Sephora in "Oh My Gosh- red" ($14). What a cute name! Here´s a (probably) similar one: the Coty Airspun Loose Face Powder ($6.99)! This could not be any closer to the original, because this powder is available since 1935! Wow! Not only was this used as a face primer- but also to remove your makeup! The Pond´s Cold Cream ($4.99) is as close as it gets- first produced in 1914 this is an old time classic moisturizer and facial cleanser! Can you believe that our ladies in the 1930s already had liquid eyeliners? The MAC Pro Longwear Fluidline ($18) is a revamped version of these. You get the precision of a liquid liner with a silkier, softer finish. 6. Max Factor Grease Paint in 5 colors. Oops- can you imagine to see the word "grease" today on a product? Doesn´t sound very appealing, right? Max Factor was the creator of grease paints - nobody has ever seen such amazing liquid colors. He would later produce 30 different colors. But what was it? You know, you could use these as a foundation, concealer but also as eyeshadows or contour color. From the picture I believe these are just 3 wooden-sticks to apply the eye liner - I am wildly guessing. However since we are having here the revamped version and I don´t want you to scratch the liner on to your eyes with some piece of wood, I recommend using instead the Elf Small Smudge Brush ($3). Lastly the Max Factor Makeup kit contained also an eye pencil. I am assuming it was black- but I am not sure. I like Essence Extreme Lasting Eye Pencils. Creamy and only $3 a pop! This Max Factor Makeup kit does not contain any Mascara. Maybe they used the wooden sticks and the eyeliner as mascara? In the 1930s ladies used "cake-mascara". Besame ($25) makes one just like that. Not sure I am going to try this one as it seems messy- and that "toothbrush applicator" scares me- but I admit I am curious about it! Labels: Home Make-up Skin Care So Retro!